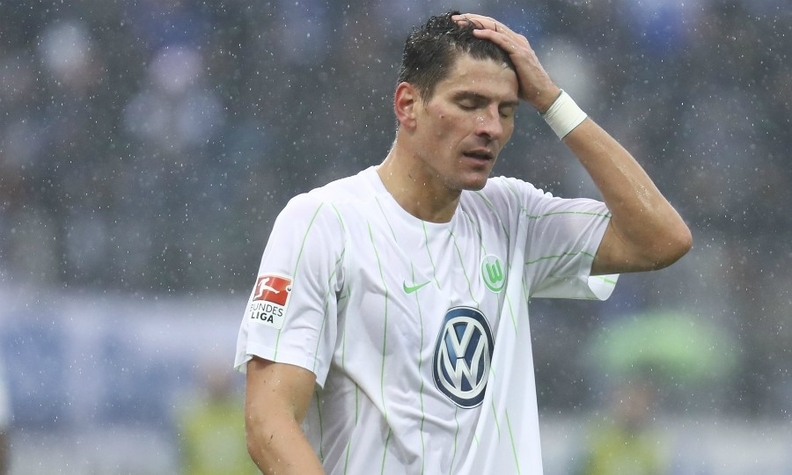 VW's sponsorship of Wolfsburg has helped the team secure high-level players such as Germany's Mario Gomez. BERLIN -- Volkswagen Group's expensively assembled soccer team VfL Wolfsburg face relegation from Germany's Bundesliga for the first time in 20 years, a move that could lead the automaker to reduce sponsorship as it grapples with its emissions crisis. Given the sport's huge global popularity, automakers have long viewed soccer clubs as an ideal marketing platform to raise brand awareness and attract new customers. Chevrolet's bowtie logo adorns the jersey of England's Manchester United, one of the world's best supported teams, while Italy's Fiat has enjoyed a long association with Italian club Juventus who have reached this season's Champions League final. A town of around 125,000 people, Wolfsburg owes its very existence to Volkswagen. Purpose-built on Adolf Hitler's orders in 1938 to make the "peoples' car," about half the town's workers have jobs directly linked to the company. Volkswagen has for years spent shareholder money in a bid to build a top soccer team even as experts questioned the business case because VfL Wolfsburg have only limited revenue streams and lack an international fan base. Of the 18 Bundesliga teams, the VW-owned club ranked fifth on market value in February at 184 million euros ($205.6 million), compared with 579 million for record 27-times champions Bayern Munich, according to data provider Statista GmbH. But the 2-1 loss on Saturday to Hamburg SV, a club with only about half Wolfsburg's market value, means they face a two-legged relegation playoff against local rivals Eintracht Braunschweig on May 25 and 29 to determine their fate. "That's a punch below the belt for players and club officials," Wolfgang Hotze, the club's executive director and a former VW manager, said on Sunday after Hamburg leapfrogged Wolfsburg in the standings. A VW spokesman on Monday declined to discuss the implications of Wolfsburg's potential relegation for the carmaker's future sponsoring policy. After VfL Wolfsburg won the German Cup in 2015 and reached the quarter-finals of the Champions League, Europe's most prestigious club competition, the following season, their fortunes declined rapidly. The struggles, however, are more due to internal disruption caused by changes of coaches and the failure to hold on to top scorer Kevin de Bruyne than cost cuts at VW. After the emissions scandal broke in September 2015, VW halted plans for a new 40 million-euro youth training center but it continues to subsidize VfL Wolfsburg at a cost of about 90 million euros per season, a source at VW said. Since 2014, VW has invested about 100 million euros to sign Belgium midfielder De Bruyne, since sold on to Manchester City, and fellow internationals Andre Schuerrle, Julian Draxler and Yunus Malli. With VW planning to cut around 23,000 jobs in Germany through 2025 to revive its troubled core brand and reviewing all investment projects, the days of record transfers at VfL Wolfsburg may be over, a senior VW manager told Reuters. Instead, VW will aim to sign players with a stronger commitment to the club and nurture youngsters, the manager said, adding that longer-term organic growth mattered more than instant success on the pitch. The new approach is backed by VW CEO Matthias Mueller who, unlike predecessor Martin Winterkorn, is no die-hard soccer fan. Under Winterkorn, VW extended direct sponsoring and support via dealers, brands and production sites to about a dozen of Germany's 18 Bundesliga clubs. Buoyed by profit-boosting expansion of premium models, VW's Audi division took a 9 percent stake in Bayern Munich in 2011 and 19.9 percent of FC Ingolstadt, another club to be relegated to the second division. Audi's holding in Bayern shrank to 8.3 percent after insurer Allianz took a similar stake. Back at VfL Wolfsburg, the club now face an emotional derby against Eintracht Braunschweig who came third in the second division after beating Karlsruhe 2-1 on Sunday. The playoffs are poised to create tension at VW as the towns are only 25 kilometers apart. Eintracht are sponsored by VW's Spanish division Seat and Braunschweig is home to the carmaker's finance arm and its oldest plant in Germany which is adjacent to the club's stadium. "It's a double whammy for us," the VW source said. "That fixture is the worst possible outcome for the region."